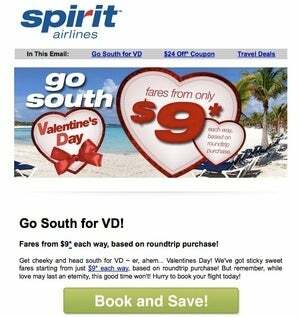 Spirit Airlines urges you to "Go South for VD!" This is a screen cap of Spirit Airlines latest email ad campaign urging consumers to "Go South for VD." Hmm, what an attractive way to make Spirit Airlines email opt-in participants truly feel like heading someplace on vacation. I know I'm just itchin' to get out of the bed and head to the clinic to get shots before I head south of the border.